Black Watch Diary readers’ responses demanded a second edition. Fellow airmen, spouses, widows, and children forwarded their personal memories, stories, and pictures. The saga of rebellious flyboys building the “world famous” Scramble Inn will tickle you into many laughs. Find out, from an insider’s perspective, what it was like onboard the Douglas C-124 Globemaster II, a heavy-lift cargo aircraft used in the 60’s. There’s a reason why they nicknamed the C-124 “Old Shaky”! From Air Force flying in all-weather jet interceptors to worldwide airlift aircraft for the Georgia Air National Guard, the author accumulated 5000+ flying hours. The 100 Plus Club is about centenarian wisdom and wit from a man who achieved over 107 years and his 83 year old follower, Josh, who is enjoying his “virtual” age of 72! In nine months, Josh elevated his 8 healthy habits to the next level, extending his life expectancy seven years. Join the club! Become excited and inspired to begin a new venture, hobby or challenge without fear of not living long enough to finish! 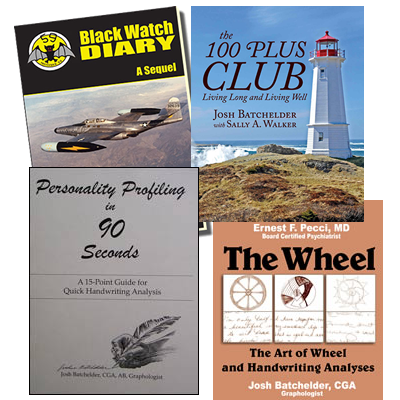 Personality Profiling in 90 Seconds was to give readers a guide to a holistic approach to quickly performing my signature 9- second method of spotting a scriptor’s dominate personality traits. It features a single-page “cheat sheet” of 15 points to look at averaging three to six seconds each. New, updated version was published in July, 2018. This expanded edition contains exciting new information about signatures. A quarter century ago, after a decade of developing his new “icebreaker” and diagnostic tool – The Wheel, Ernest F. Pecci, MD, presented his theory and practice of wheel analysis at a seminar for the Northern California Chapter of The International Graphoanalysis Society (IGAS). Handwriting Reveals You was written and published in response to audiences wanting a book for the novice to easily see the dominate personality traits in themselves and others.